Dan Willard began playing the clarinet at age ten and performed in various school bands. He studied privately with Richard Firth. After high school he studied music at El Camino College and took private lessons with David Atkins while a student at CSULB. Dan has played clarinet with the Torrance Symphony, Bellflower Symphony Orchestra, Southeast Symphony, and the Long Beach Ballet. In 1986 he co-founded the West Coast Woodwind Trio, which performed classical selections from the standard repertoire as well as his own arrangements of popular music. In 2001 Dan took part in a recreation of Benny Goodman’s breakthrough 1938 Carnegie Hall concert, transcribing many of the recordings and playing Benny Goodman’s clarinet solos. The concert took place in Ventura and a CD was made which is available from the West Coast Traditional Jass Club. In 2002 Dan played clarinet on an album of Dixieland standards called How Jass Music Is Made with The Untouchables. In 2006 Dan recorded the album Happy Feet with the Dixieland band Ulysses Jasz on which he played clarinet and sax. Dan has performed numerous musicals on Clarinet including Annie, South Pacific, Guys and Dolls, West Side Story, Kiss Me Kate, Cabaret, Carousel, My Fair Lady, Fiddler on the Roof, Sound of Music, The Pirates of Penzance, and The Music Man. Dan also plays clarinet in recordings of his own compositions. 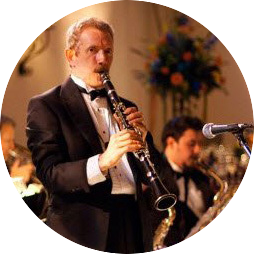 Dan continues to play clarinet in musicals and with his own Dixieland band, Dan Willard and His Old School Jazz; his own jazz band, The Dan Willard Jazz Band; and his own big band, The Dan Willard Band. He teaches private clarinet lessons at Ojai Valley School, the Thacher School, and at his home in Oak View.